The exclusive woodland setting of Doral Woods is an excellent place for relaxation and yet is within convenient reach of all the action of Disney and the other attractions. Be at one with nature in our unspoilt landscape. You can enjoy your time at the house by relaxing in the heated swimming pool, on the extended decking or in the 6 seater hot tub. This self catering villa provides a home from home experience with a well equipped kitchen and laundry room. There is plenty of entertainment from the games area with air hockey, table tennis and darts to the PS2 and extensive video/DVD library of over 100 titles including many of the favourite classics. If that is not enough then there are many board games and even a library of books. We also provide a mini gym to keep you in trim whilst away. The Setting: Doral Woods is a very peaceful development set within a wildlife reserve within each reach of Disney and lots of other attractions. It has a community pool as well as a floodlit tennis court for use by our guests. Within a very easy drive are supermarkets, golf and horse riding. Just down the road is the Osceola Environmental Center which is open at weekends to visitors and is free of charge. There you can wander along the board walk over the swamps and go alligator spotting. You will also see many of the wonderful water birds of Florida and also see a Bald Eagles untidy but enormous nest. A world worth exploring. Alternatively you can take an air boat ride through swamp land and for a real scare take the midnight tour. The Accommodation: The villa is particularly well suited for two families or for those travelling with a nanny or a 'Granny'. There are two master suites the main one with a King sized bedroom cable TV/DVD and luxurious bathroom with roman tub, his and hers basin and large walk in shower with seat. The other, although smaller has a Queen sized bed cable TV and its own private bathroom with bath and shower. The villa is very child friendly with lots of baby/ child equipment, use of which is free of charge. There are child-proof locks on some cupboards. It is thoughtfully furnished and versatile with plenty of space to accommodate larger parties. See floor plan under 'more details'. The kitchen offers a home from home experience, being very well equipped for those preferring to do their own catering but still feeling they are on holiday. Laundry facilities are provided in a separate air conditioned utility room and include a super sized washing machine and tumble dryer. The Facilities: Credit cards accepted. The home provides a peaceful haven to return to after the hustle and bustle of a day out at the parks. 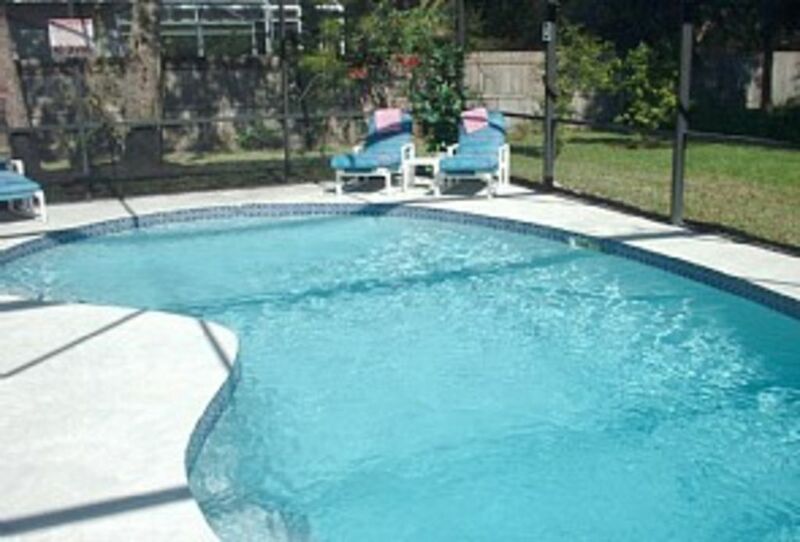 Alternatively it is a relaxing base for lazing around the pool or soaking up the therapy of the deep hot tub. Inside activities include a extensive range of in house videos/DVDs and many board games for those quality moments with your children or for inter-family challenges. For those feeling more like some action then the games area with air hockey, table tennis table, darts board, mini gym and of course there is the flood lit tennis court and large community pool. So much to do! Luxury Roman tub in master suite - bring your own bubbles! Over sized shower with therapy jet in master bathroom. Over-bath showers have glass screen in other bathrooms- especially useful when bathing small children who like to splash! Flood lit tennis court, balls and racquets provided but serious players may wish to bring their own. Stand alone 6 seater hot tub is located on pool decking within screen. A gas BBQ is available for use by guests. Breakfast nook and breakfast bar provide more casual alternative for dining, as does the covered Lanai with comfortable patio furniture. The house has extensive entertainment facilities. HD flat screen TV with 225 cable channels. The home theatre system (surround sound) is complimented by a video/DVD library with over 100 titles including many of the classics - some must see prior to taking the ride at the parks eg Twister, The Mummy and Tower of Terror. A play station 2 with games is located in a twin bedroom allowing the kids to escape from the adults for some quiet time and for the more energetic air hockey, darts and table tennis are provided in a games area. FREE long distance and international telephone calls are available to our guests. Doral Woods is situated 10 miles south of Highway 192 on Poinciana Boulevard and 3 miles south from the intersection with the Orange Blossom Trail (17/92). The nearest shops are at Poinciana, a 5 minute drive away, where you will find a choice of food supermarkets, a bank, a variety of restaurants, a nail bar and a Super Wal-Mart providing all your needs. Travelling time to the many tourist attractions ranges between 15 to 30 minutes drive. The closest beaches are those on the Atlantic and are just under 1 hour travelling East as is Kennedy Space Centre. Travelling west towards the gulf coast (Tampa, Clearwater and St Petersberg) will take about one and a half hours. Here you will find Busch Gardens and lots of wonderful beaches. If you don't fancy driving to & back from Busch after a heavy day on the rollercoaster’s watch out for the shuttle bus which goes daily from the Orlando area. Other Activities: Nature walks,Environmental Centre, bird watching, theme parks, eating, cinema, shopping and more shopping!